Avianca Brazil plans to slow down expansion in 2013, taking a hiatus following a growth spurt which saw the carrier more than double in size in less than two years. Avianca Brazil’s outlook remains bright despite Brazil’s challenging market, which has led the country’s two largest carriers to cut domestic capacity, as it is poised to benefit from anticipated membership in the Star Alliance and the possible acquisition of TAP Portugal by its parent company. Avianca Brazil is 100% owned by Brazilian investment firm Synergy Group, which is also the largest shareholder in Avianca-TACA Holding, the parent of several carriers in other Latin America countries including four members of the Star Alliance. Synergy is also the only remaining bidder in the sale of Star member TAP Portugal, which has an extensive network in Brazil that would add significant value to Avianca Brazil’s all-domestic network. Avianca Brazil president and Synergy Group board member Jose Efromovich told the ALTA 2012 Airline Leaders Forum in Panama on 17-Nov-2012 that Synergy currently has a team of 38 people conducting due diligence on TAP and putting together a final bid. He said Synergy plans to present its final binding bid and proposal to the Portuguese Government on 07-Dec-2012. Synergy was initially one of 10 companies that expressed interest in acquiring TAP, and one of three companies which submitted proposals as part of an initial phase. But Synergy in Oct-2012 was the only proposal deemed to meet the outlined requirements. Mr Efromovich told the ALTA Forum that while it may seem that Synergy is “lucky” to be the only bidder remaining, it is not an ideal scenario because the Government will have no benchmark when determining whether the price Synergy offers represents a fair value for TAP. Mr Efromovich said the team doing due diligence is now trying to determine the value of TAP. “At this point we are only working on an opportunity that could be positive for the group,” he said. Mr Efromovich declined for now to discuss the potential synergies with Avianca Brazil should Synergy be successful at acquiring TAP Portugal. But the potential synergies are seemingly obvious given Avianca Brazil’s domestic network and TAP’s strength in the Brazil-Europe market, where it is the largest carrier. TAP serves 10 destinations in Brazil and currently accounts for 24% of total capacity between Brazil and Europe, according to Innovata data. TAP also has a strong network in western Europe, where it has over 40 destinations that feed its flights to Brazil as well as to Caracas in Venezuela and New York and Miami in the US. TAP also has a niche network in Africa consisting of 13 destinations. TAP now works closely with Brazil’s largest carrier TAM, which feeds TAP at TAP’s Brazilian gateways and currently does not serve Portugal. But TAM is required to leave the Star Alliance within the next two years to adhere to a stipulation by competition authorities, which in approving TAM’s merger with LAN determined that any carrier in the new LATAM Airlines Group cannot be in the same alliance as Avianca-TACA. Colombia’s Avianca, El Salvador-based TACA International, TACA Costa Rica (also known as LACSA) and TACA Peru formally joined Star in Jun-2012. TAM is expected to join sister carrier LAN in oneworld although becoming non-aligned is also an option, albeit unlikely. As CAPA previously reported, Avianca Brazil is expected to join the Star Alliance as part of a later phase along with Avianca-TACA’s Ecuadorean subsidiary AeroGal. Mr Efromovich said on the sidelines of the ALTA Forum that Avianca Brazil needs to first upgrade its IT platform, including its reservation system, before it can consider joining Star. Avianca Brazil currently uses a local Brazilian reservation system which he said needs to be replaced regardless as it is intended for small carriers and Avianca Brazil has become too large. Avianca-TACA overhauled its IT system prior to entering Star, while plans to introduce new IT systems at AeroGal and Avianca Brazil were delayed until after Avianca in Colombia and TACA completed the transition. Mr Efromovich acknowledged that Avianca Brazil needs a more robust IT system as it has more than doubled in size in less than two years. Avianca Brazil will also need a new IT system to support an international network. The carrier currently operates only domestically, having dropped its only international route, Sao Paulo-Bogota, earlier this year. But Avianca Brazil, which also briefly operated long-haul flights with Boeing 767s in 2008 (at the time the carrier was known as OceanAir), will likely re-introduce international services over the medium to long-term. The carrier is also expected to look to offer its customers a virtual international network through TAP and other Star members. Avianca Brazil currently only codeshares with its sister carriers in Colombia and Peru, which operate five routes to Brazil and receives feed from Avianca Brazil’s domestic network. Avianca Brazil is now Brazil’s third largest airline group behind Gol-Webjet, TAM and Azul-TRIP. Avianca Brazil currently serves 24 domestic airports and has about a 5% share of the Brazilian domestic market but has the fastest growing airline in Brazil so far this year. Avianca Brazil grew domestic ASKs by 87% through the first nine months of 2012, according to Brazilian ANAC data. 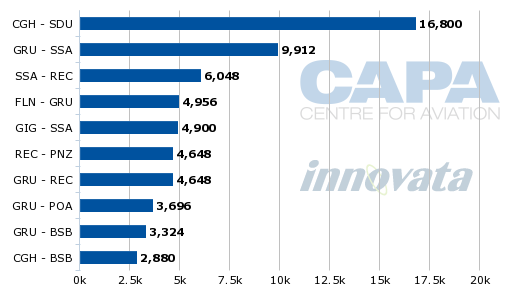 The carrier accounted for 4.7% of ASKs and 5.1% of RPKs in the Brazilian domestic market in the first nine months of 2012, compared to only 2.6% and 2.9%, respectively in the first nine months of 2011. Note: Gol figures include Webjet and Azul figures include TRIP although Azul-TRIP acquisition has not yet been completed. 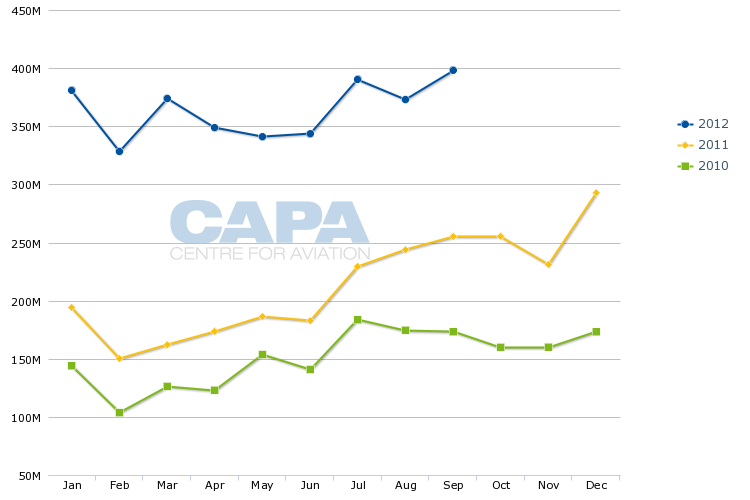 Avianca Brazil for the first time in its history recorded in Feb-2012 a monthly market share figure of above 5%. 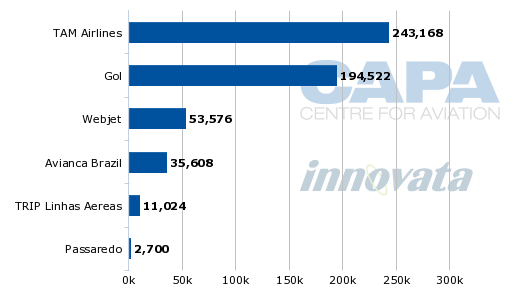 The carrier captured a company record 5.5% of the domestic market in Sep-2012. It also flew a record 398.4 million RPKs in Sep-2012. The 84.5% RPK growth recorded by Avianca Brazil in the first three quarters of 2012 follows RPK growth of 40.8% in 2011 and 27.1% RPK% in 2010, when the carrier resumed expansion after a two-year hiatus. Avianca Brazil in 2Q2008 cut capacity and implemented a restructuring which resulted in its share of the domestic market dropping to less than 3%. The carrier subsequently kept its capacity flat in 2H2008 and throughout 2009. After keeping the size of its fleet stable at only 14 aircraft in 2H2009 and all of 2010, Avianca Brazil resumed growth in Mar-2010 after taking its first batch of A320 family aircraft. Three 132-seat A319s joined the carrier’s fleet of 14 100-seat Fokker 100s during 2010. In 2011, expansion was further accelerated as five A318s, two A319s and four 164-seat A320s were added, giving the carrier a fleet of 25 aircraft at the start of 2012. Mr Efromovich said Avianca Brazil will end 2012 with a fleet of 34 aircraft. The nine aircraft being added in 2012 include another five A318s. But Mr Efromovich told CAPA at the Nov-2012 ALTA Forum that the carrier now plans to keep the size of its fleet roughly flat in 2013. Avianca Brazil is still committed to taking five additional A318s during 2013, the last batch of 15 ex-LAN PW6000-powered A318s that Synergy initially committed to acquiring in 2011. But Mr Efromovich said Synergy has decided to accelerate retirement of some of its Fokker 100s and now plans to remove four or five Fokker 100s from service in 2013. Although the carrier’s fleet is not expected to grow by more than one aircraft in 2013, Mr Efromovich pointed out that capacity will grow on some routes as Avianca Brazil configures its A318s with 120 seats compared to only 100 seats on its Fokker100s. Mr Efromovich said Avianca Brazil still expects capacity expansion of about 33% for the full year in 2013, down from anticipated full-year capacity growth of 90% for 2012. The 33% growth is driven by the full year impact of aircraft added in 2H2011 as well as swapping five Fokker 100s for larger A318s. Avianca Brazil was previously planning to start phasing out its Fokker 100s in 2014, when the next heavy maintenance check is due. But Mr Efromovich said in the current market environment it makes sense to start removing the Fokker 100s a year before they come up for heavy maintenance. Synergy acquired 29 Fokker 100s in 2005 from American Airlines, with 15 being handed to Avianca in Colombia and 14 to Avianca Brazil (then known as OceanAir). Avianca accelerated the retirement of its 15 Fokker 100s in 2011, when it was offered an attractive proposal to lease 15 CFM56-powered A318s from GECAS which were previously operated by now defunct Mexicana. He added that the huge growth over the last two years was pursued because Avianca Brazil had become “too small”. While the carrier halted all expansion in 2H2008 and all of 2009, all other major Brazilian carriers pursued rapid growth, leading to a significant drop in Avianca Brazil’s market share. The growth in 2011 and 2012 has allowed Avianca Brazil to close the gap with its larger rivals that had widened in previous years. The growth this year has come as Brazil’s two largest carriers, TAM and Gol, have cut capacity in response to over-capacity in the domestic market, particularly on trunk routes. TAM and Gol have also unveiled plans to further cut capacity in 2013. Mr Efromovich told the ALTA Forum that while all Brazilian carriers are now unprofitable, Avianca Brazil has been incurring losses that are significantly less than its competitors. The carrier is confident its relatively small size positions the carrier well when market conditions finally improve. Mr Efromovich said he was confident that Avianca Brazil’s production positioning gives the carrier an advantage over rivals. Avianca Brazil is a full service carrier operating with a single-class product, positioning it between low-cost operators Azul and TRIP and network carrier TAM. Unlike Azul and TRIP, Avianca Brazil also has an extensive portfolio of slots at Brazil’s main hubs and operates on the profitable shuttle route connecting the downtown airports of Sao Paulo and Rio de Janeiro. Sao Paulo Congonhas-Rio de Janeiro is currently Avianca Brazil’s largest route based on seat capacity. Avianca Brazil also has a large domestic operation at Sao Paulo’s slot controlled international airport Guarulhos. 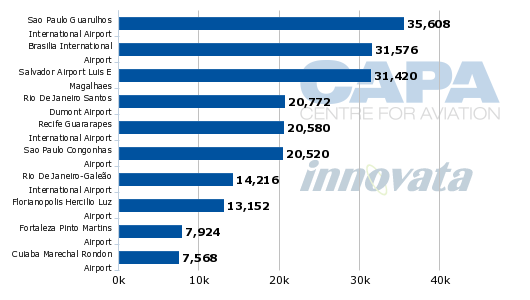 Avianca Brazil now accounts for 7% of domestic capacity at Guarulhos, according to Innovata data. Mr Efromovich told CAPA that the carrier would like to secure more slots at Guarulhos which would allow it to increase frequencies on trunk routes and provide Star carriers with more connections. This is important to Star as it has over 10 members which currently serve Guarulhos. Guarulhos is currently Avianca Brazil’s largest base, followed by Brasilia and Salvador. All three airports are served by TAP. While several Star carriers also serve Rio de Janeiro international airport Galeao, TAP is the only Star member serving Brazil’s secondary cities. TAP is the only long-haul carrier serving several Brazilian airports, nearly all of which are also served by Avianca Brazil. Azul and TRIP, which are now in the process of merging, have also continued to expand rapidly. With the Gol and TAM Groups (the former is now in the process of acquiring fellow low-cost carrier Webjet), continuing to cut capacity, the new Azul-TRIP group and Avianca Brazil are expected to continue recording market share gains in 2013 even if their pace of expansion slows. Avianca Brazil mainly focuses on Brazil’s larger cities while Azul and TRIP, both of which operate Embraer regional jets and ATR turboprops, focus more on regional routes. Mr Efromovich said the carrier serves only four or five smaller destinations and will continue to focus its network on major cities although he acknowledged there will be “a need to make them a little more dense” as Avianca Brazil prepares to start feeding Star members. Given its focus on trunk routes, Avianca Brazil should be positioned to take advantage of the capacity cuts implemented by larger Gol and TAM while Azul-TRIP, which has a much larger domestic network than Avianca Brazil as the duo serves approximately 100 destinations, is positioned to take advantage of the continued growth in demand in regional centres. 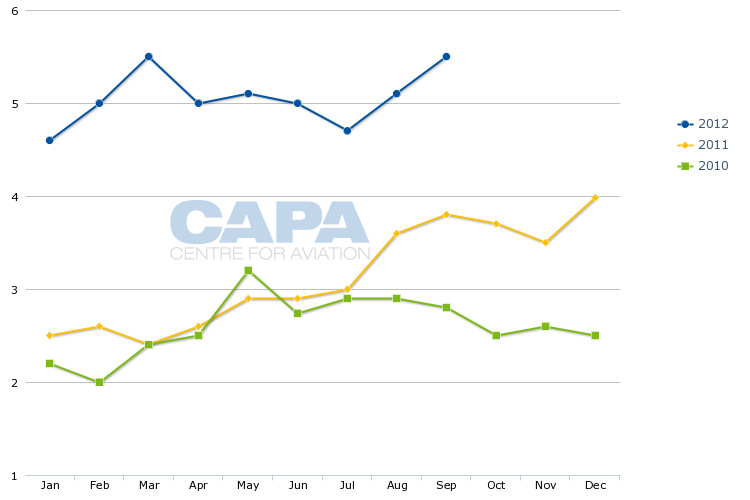 Avianca Brazil’s expected 33% ASK growth for 2013 should see the carrier capture about 7% of the domestic market by the end of 2013. Azul-TRIP, meanwhile, could see its share of the domestic market approach 20% by the end of 2013. As a result, Avianca Brazil will remain much smaller than Brazil’s three main leading groups. But by serving almost all major domestic destinations Avianca Brazil has the network to be a significant player, including in the corporate sector, and provide sufficient feed to TAP and all Star carriers serving Brazil. Mr Efromovich pointed out that Synergy has the flexibility to pursue faster growth at Avianca Brazil than now planned should market conditions dictate by allocating to Brazil some of the A320 family aircraft from the current order book of Avianca-TACA. The carrier could also change its mind and keep more of the Fokker 100s operating for another year. All of Avianca Brazil’s A319s and A320s came from Avianca-TACA orders and Synergy often decides only a few months prior to delivery which carrier will receive each new aircraft. There are six A320 operators under Avianca-TACA or Synergy, with certificates in Brazil, Colombia, Costa Rica, Ecuador, El Salvador and Peru. But Avianca Brazil could face challenges as economic growth in Brazil slows, impacting all carriers. The potential acquisition of TAP by Avianca Brazil parent Synergy may also lead to integration challenges and divert resources away from Avianca Brazil. All other airline groups, including LAN-TAM parent LATAM Airlines Group, elected against submitting bids for TAP, an indication of the challenges any airline buyer could face in trying to digest and integrate the Portuguese carrier. LATAM CEO Enrique Cueto told the ALTA Forum the European market works very differently than the Latin American market, which could make any acquisitions in Europe challenging for Latin American groups to complete. “You don’t know the risks they are assuming,” he said. Mr Cueto added that LATAM would pursue additional acquisitions in the region or overseas if it makes sense but warned “it doesn’t make sense to just focus on growth”. Mr Cueto said for now LATAM is focused on integrating LAN and TAM and exploiting network synergies. As LATAM is by far the largest airline group in Latin America and already has a large international network in Brazil through TAM, the group could afford to pass on TAP. For Avianca-TACA and Avianca Brazil, which in future may move from Synergy to Synergy-controlled Avianca-TACA Holding, the opportunities made possible by a potential acquisition of TAP are more enticing. Avianca-TACA remains a much smaller group than LATAM, even when including Avianca Brazil, and the group has a very minor presence in the trans-Atlantic market as its European network is limited to just two destinations. In Brazil, the Avianca brand has grown significantly over the last two years domestically but only has a presence on five international routes – all of which are operated by its Colombian or Peruvian subsidiaries. Combining with TAP and joining Star would give Avianca Brazil a huge boost and make it a global player. It would also help the long-held ambitions of the Efromovich family, which owns Synergy, to be a major player in Brazil’s long-haul market. In 2007 Synergy looked at acquiring Varig while the former flag carrier was in bankruptcy. Synergy ended up deciding against making a bid for Varig, leaving Gol to acquire the airline, including its long-haul network which ended up being short-lived under Gol. Five years later Synergy, which broke into the aviation industry in 1998 with the acquisition of OceanAir and much later acquired Avianca and Ecuadorean carriers AeroGal and VIP, has another golden opportunity. There will certainly be risks and challenges if Synergy is successful in acquiring TAP. But there would be huge benefits for Avianca Brazil as well as synergies for Avianca-TACA, helping the group close the gap with much larger LATAM.